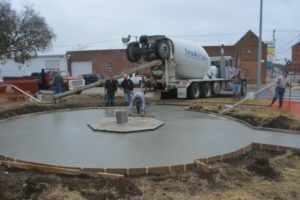 Construction of a tribute to firefighters has attracted several volunteers including retired firefighters who assisted with various public fundraisers in the initial phases of the project and later provided in-kind labor and construction oversight. Other volunteers were retired members of a local construction company who assisted with the general contracting as well as obtaining correct building construction permits and plans, including designing and building a jig and containing system for holding all the ornamental donor bricks. Several current members of the fire department also volunteered free time and labor for the site work and masonry work done. The plaza is estimated to be completed in May. A grant from the Hansen Foundation is helping with this project.